Residents can recycle food scraps and food-soiled paper along with yard trimming in their green cart. Peels, scraps from kitchen prep, leftovers, napkins, paper cups….all of these items will from now on feed our new Anaerobic Digester (AD) instead of the landfill! The digester generates compost and clean fuel to power our collection trucks. Use your Kitchen Pail to easily and conveniently collect food scraps in your kitchen. To keep your pail clean and cut down on mess, line your kitchen pail with newspaper and wrap soggy food scraps in paper bags or paper towels to absorb moisture. 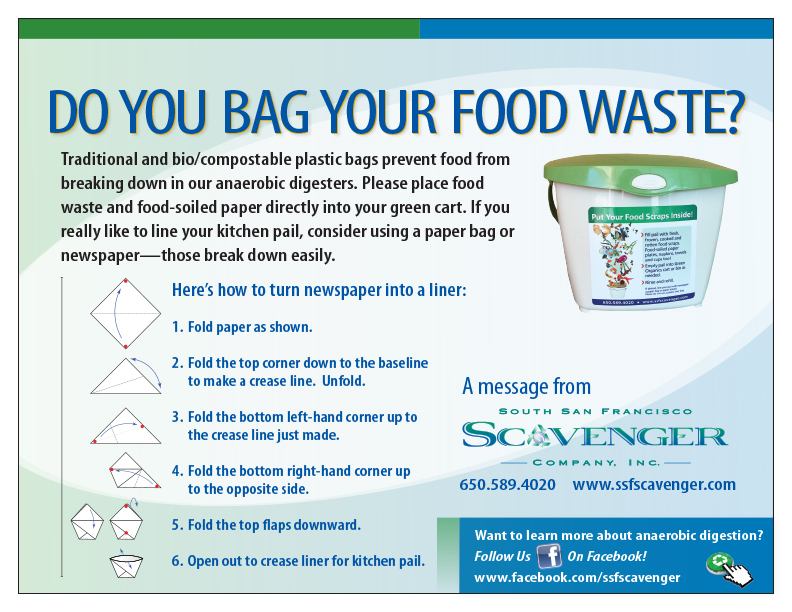 Empty the contents of the food scraps pail into your green cart as needed. Please do not leave the kitchen pail inside the green cart or at the curb. We will only collect food scraps that are placed inside your green cart. Tip: To prevent any feared odors place food scraps in the freezer until the night before collection.